Last Tuesday, we were joined by Suzanne Tick and her colleague Raquel Berrios for an exploration of how design, fashion, art, and architecture have changed and will continue to change to reflect our increasingly post-gender society. In case you missed it, we’ve prepared a list of Suzanne’s answers to some of the best attendee questions about how these changes are reflected within the workplace. “The Vessel,” by David Altmejd. Suzanne used this photo to illustrate the growing popularity of the use of transparent materials in design. Attendee: We’ve gone from a male-dominated workplace to women playing a bigger role, to more open sexuality and a larger focus on transgender issues. How do you think that will impact public spaces within workplaces, i.e. restrooms, locker rooms, etc.? Suzanne: I think the whole restroom thing is shifting so that there are unisex restrooms now going into most schools. In terms of corporate America, I’ve had a lot of discussions about that. It’s interesting, when you think about what women need to bring into a restroom, well, some men have makeup now, too! I think I’ve seen a more – I hate to use the word collaboration – but I think this idea of talking, more places to communicate, the “softening” of offices, is part of this shift. It’s about more communication, having more conversations, getting people together is the wave of the future. Attendee: There are many polarities in the workplace and men and women are just one of them. Do you see other polarities finding equivalent expression, for example introverts vs. extroverts? Suzanne: We’ve been talking about this with a lot of design firms in terms of the privacy issues. A lot of people don’t want to be in a benching system. 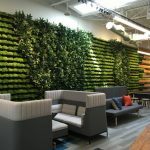 People need spaces for contemplation, and there’s a need and desire for those things in the workplace, so there is a rethinking of the benching solution for introverts. But there are different styles of people in how they work, and of different jobs in terms how much open space is needed. Attendee: How do you think the shift from male-dominated workplaces to workplaces with more women are affecting the way that we design the workplace? Suzanne: We look a lot at color as an influencer on all of that. Moving away from the hunter green, deep burgundies to a softer, warmer, and lighter palette. We’ve talked about this whole concept of “green” being genderless; greens, and yellows, and grays all over the place, with bright accents. And I think the scale of spaces has gotten somewhat smaller. The scale of the furniture is not the way it used to be. And not that that means it’s “feminine,” just a little bit more intimacy. How else do you see “masculine” and “feminine” influences going in terms of spatial wants and needs? Raquel: In terms of “intimacy” and “openness,” those are traits that we might consider feminine versus perhaps maybe thicker walls, and things that are stronger, and privacy as things that are masculine.Suzanne: I think of Zaha, one of the first female architects that “shifted the plane” and went with softer angles. So softening the plane of an environment, and making things more circular — no square sides at all — it’s more fluid, and we’re seeing a lot more fluidity in workplaces. Attendee: How do you express individuality if we’re moving toward a totally genderless society? Raquel: When we showed the transparent shirt, what you’re seeing is the person behind that’s inside of that clear shirt. In the office, we’re moving toward lightness, more interaction. On one side there’s a disappearance of materiality, but on the other side, there’s more social interaction and more opportunitues for people to say who they are. Suzanne: The other area of individuality I’ve seen more recently is in the world of art, entering into a lot of corporate spaces. The actual hand craft is really important so that the softening comes from the crafted material or the hand of an artist or the glazing on the glass and having a budget for art that can really help to explore how people want to be seen as a customer. I think people are looking at the individuality of how people are expressing themselves in terms of craft. Thanks again to Suzanne and Raquel, to our sponsor, Tandus Centiva, and to all of our attendees! 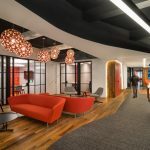 Please plan to join us for our next webinar on September 23, “Change Your Space, Change Your Culture: How Engaging Workspaces Lead to Transformation and Growth,” presented by Rex Miller. Click here for tickets and more details. Check out the first nonprofit shared workspace dedicated to literacy.